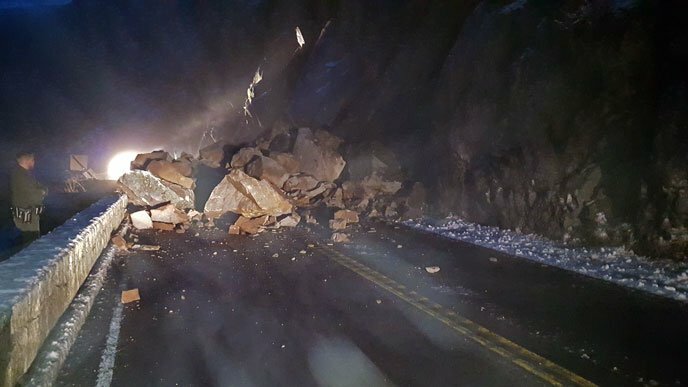 It is usually considered the all-weather entrance to Yosemite National Park, a reliable route no matter the conditions, but not this week as a rockslide has closed El Portal road. Yosemite park officials report that Hwy 140 is closed from the park boundary in El Portal to the junction with Hwy 120 after the slide on Thursday morning Jan 7. Until further notice, travelers entering the park must detour to Hwy 41, adding an estimated 2-3 hours to the journey. Fortunately nobody was in the path of the rock slide, which by the looks of the photos released by the park service would not have fared well if they had. Park officials cite the Dog Rock Fire, which occurred in the area below the Arch Rock Entrance Station in October 2014. Fires tend to loosen ground soil that can typically lead to landslides. In the case, increased rain in recent days put the rocks in motion.